Everyone remembers their first moment. That also includes characters. 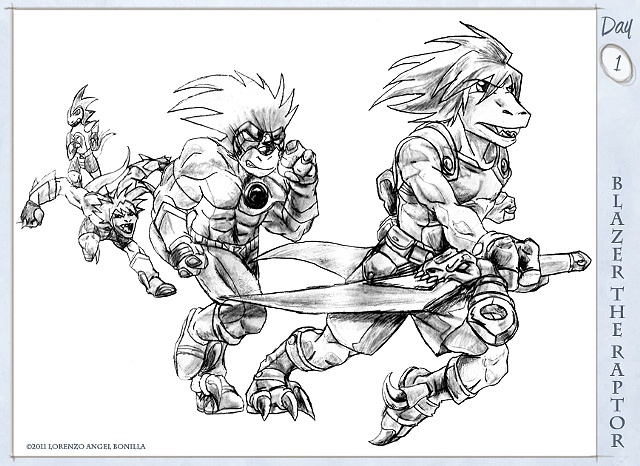 Blazer the Raptor was my first character that I drew as a child based on several unrelated sources. The first is my love of dinosaurs and the second was Sonic the Hedgehog. Later on, he took on aspects of Goku and even later, Naruto. Blazer is a character that always pops out now matter what I draw, I always fall back and revisit him, changing his look from time to time based on whatever interests me at the time. The image demonstrates his evolution from his earliest depiction up to his most recent and current incarnation. From the very first, Early Blazer version, to Goku- Haired Blazer, to Extremely Dark Blazer, and finally, his more current and by far, my favorite version, simply called Blazer. Now for character bio: Blazer is a Velociraptor from the Fire Valley Clan in Patagenea. He was a regular child until his Animus (chakra, ki, spirit energy) activated, for which any saurian demonstrating Animus is automatically drafted into the military of their respective Clan as a special class, dubbed Servitors. As a Servitor, Blazer is trained in utilizing armed and unarmed combat while being taught the Anima Techniques from his master, Tenken. Blazer’s main antagonist is the dreaded Rexon Tyrannus, a machinist overlord who uses an entire mechanized army to seize control and subjugate all the Clan lands, for which Blazer is on a mission to forge a alliances with all the Clans to defeat this encroaching threat and for Blazer, he desires to destroy Tyrannus for a more personal reason; for , Tyrannus was responsible for the death of Blazer’s father and Blazer would like to see justice enacted, by his own hands. During his travels, Blazer will encounter obstacles that will will challenge him both his physical and mental abilities while exploring the vast and diverse lands of each of the Clans. Blazer will also encounter other Servitors like him, each with their own repertoire of amazing abilities. Blazer’s abilities focus on using Fire Elemental and Inner Energy Anima Techniques which range from projectile attacks like the Fire Rocket, to enhancements, such as Afterburner, a speed boost technique. Blazer is capable of wielding a Raptor Class Sickle Sword, forged in Star Metal, which can be channeled with Animus energy to superheat the blade for increased cutting power or to deliver a charged attack. Blazer is also capable of fighting with claw daggers and throwing hooks. His fighting style has a heavy emphasis on speed based attacks, while using the momentum to deliver hard strikes when they count. But, Blazer’s biggest assset is his brain, for he does not engage battles head on and utilizes strategy over brute force in defeating his opponents. This concludes the introduction of my character. I hope you like it.